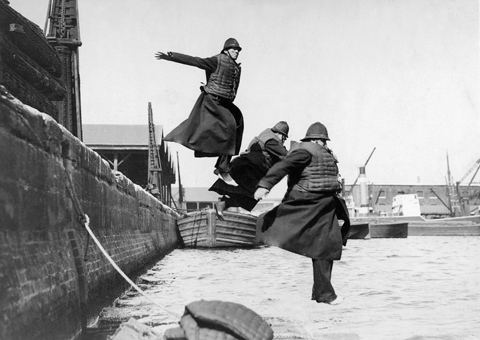 This photograph shows Port of London Authority policemen testing life-jackets by jumping into the water at the West India Docks, in around 1930. Historic photographs and records of the River Thames are being catalogued in a move that may give the public unprecedented access to the 250-year-old archive. The Port of London Authority (PLA) has embarked on a three-year project that aims to make it easier for historians and river lovers to search and view the images in future years. ?The PLA archive collection is unique. It covers everything from the initial grand development schemes through to the details of day-to-day life in the docks,? said Museum of London archivist Claire Frankland. 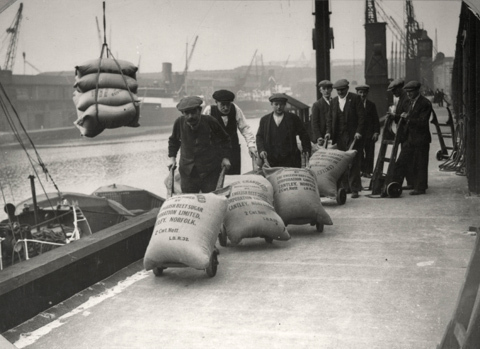 ?It is an archive of international significance, an invaluable resource for social, economic and maritime historians, as well as those pursuing interests in local and family history.? Among the gems is a photo of policemen testing life jackets by jumping into the water at the West India Docks. It dates from around 1930 (pictured). The archive also features a panorama of the river from 1937, covering the stretch from London Bridge to Greenwich. Documents include river charts, architectural drawings and papers relating to 19th century dock companies.